Offering you a complete choice of products which include mini offset, automatic mini offset printing machines, automatic mini offset printing machine, wedding card offset machine, single color mini offset printing machine and mini offset printing machine. FAIRPRINT’s Little Master is ideal for short run jobs. Mini Offset is a Great Solution for Offset Printers who are expanding for printing of small size papers and is Best Value for Money for offset printers entering into offset printing work with low budget. This Mini Offset is compact, easy to run & highly productive which can be used in Screen Printing Houses, Letter Press Houses, D.T.P. units & Small Enterprises – Thus opening new venues for shifting to Advance Technology by providing opportunity for becoming offset printers at no hurdles. 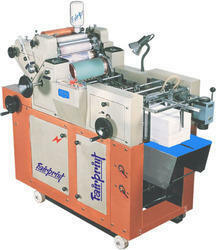 This machine is commonly known as Mini Offset or Baby Offset worldwide. FairPrint's sophisticated Mini Offset Printing Machines are widely appreciated and recognized for their high quality, reliability, efficiency and economy in India and Worldwide. We are no. 1 mini offset manufacturers, mini offset dealers, mini offset suppliers and mini offset exporters of Mini Offset Printing Machines in India. Our product range consists of Mini Offset Printing presses & Mini Offset Printing Machines which gives enormous flexibility to print sheets of small & big sizes as per the requirements. Fair Deal Engineers are the leading mini offset manufacturers in india and mini offset dealers in india. Mini Offset considers various changing needs for offset printers. Mini Offset is easy to operate having user friendly features and have short changeover time. We are the mini offset manufacturer, mini offset dealer, min offset supplier & mini offset exporter and are best mini offset manufacturer in india and mini offset dealer in india. 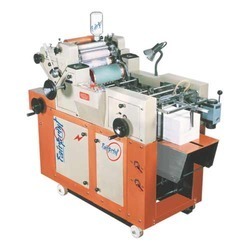 We are no.1 mini offset manufacturers, mini offset dealers, mini offset suppliers and mini offset exporters of Automatic Mini Offset Printing Machines in India. Our product range consists of Mini Offset Printing presses & Automatic Mini Offset Printing Machines which gives enormous flexibility to print sheets of small & big sizes as per the requirements. We are the automatic mini offset manufacturer, automatic mini offset dealer, min offset supplier & mini offset exporter and are best automatic mini offset manufacturer in india and automatic mini offset dealer in india. FAIRPRINT’s Little Master is ideal for short run jobs. Automatic Mini Offset Printing Machine is a Great Solution for Offset Printers who are expanding for printing of small size papers and is Best Value for Money for offset printers entering into offset printing work with low budget. This Mini Offset is compact, easy to run & highly productive which can be used in Screen Printing Houses, Letter Press Houses, D.T.P. units & Small Enterprises – Thus opening new venues for shifting to Advance Technology by providing opportunity for becoming offset printers at no hurdles. 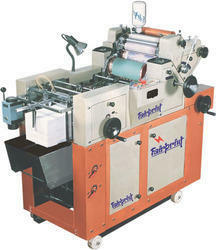 This machine is commonly known as Mini Offset or Baby Offset worldwide. Fair Print's sophisticated Mini Offset Printing Machines are widely appreciated and recognized for their high quality, reliability, efficiency and economy in India and Worldwide. Fair Deal Engineers are the leading automatic mini offset printing machine manufacturers in india and automatic mini offset printing machine dealers in india. We are the automatic mini offset printing machine manufacturer, automatic mini offset printing machine dealer, min offset supplier & mini offset exporter and are best automatic mini offset printing machine manufacturer in india and automatic mini offset printing machine dealer in india. FAIRPRINT’s Little Master is ideal for short run jobs. Wedding Card Offset is a Great Solution for Offset Printers who are expanding for printing of small size papers and is Best Value for Money for offset printers entering into offset printing work with low budget . This Mini Offset is compact, easy to run & highly productive which can be used in Screen Printing Houses, Letter Press Houses, D.T.P. units & Small Enterprises – Thus opening new venues for shifting to Advance Technology by providing opportunity for becoming offset printers at no hurdles. 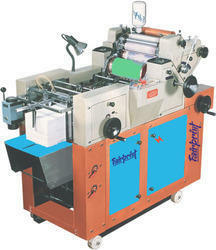 This machine is commonly known as Mini Offset or Baby Offset worldwide. FAIRPRINT’s Little Master is ideal for short run jobs. Single Color Mini Offset Printing Machine is a Great Solution for Offset Printers who are expanding for printing of small size papers and is Best Value for Money for offset printers entering into offset printing work with low budget . This Mini Offset is compact, easy to run & highly productive which can be used in Screen Printing Houses, Letter Press Houses, D.T.P. units & Small Enterprises – Thus opening new venues for shifting to Advance Technology by providing opportunity for becoming offset printers at no hurdles. This machine is commonly known as Mini Offset or Baby Offset worldwide. Fair Deal Engineers are the leading single color mini offset printing machine manufacturers in india and single color mini offset printing machine dealers in india. We are the single color mini offset printing machine manufacturer, single color mini offset printing machine dealer, min offset supplier & mini offset exporter and are best single color mini offset printing machine manufacturer in india and single color mini offset printing machine dealer in india. Our company specializes in manufacturing qualitative range of Mini Offset Printing Machine. These machines are manufactured under the close supervision of our experienced engineers using high quality components. Furthermore, we offer these machines o clients in various configurations at market-leading prices. Size 15" x 20" 16" x 22" 16" x 22" 18" x 24.5"
(7000 I.P.H. - Paper) 2500 I.P.H. Power Supply 220 v / 1 Ph. / 50 Hz. 220 v / 1 Ph. / 50 Hz. 220 v / 1 Ph. / 50 Hz. 220 v / 1 Ph. / 50 Hz. Fair Deal Engineers are the leading single color mini offset manufacturers in India and single color mini offset dealers in India. We are the single color mini offset manufacturer, single color mini offset dealer, min offset supplier & mini offset exporter and are best single color mini offset manufacturer in India and single color mini offset dealer in India. Fair Deal Engineers are the leading wedding card printing machine manufacturers in india and wedding card printing machine dealers in india. We are the wedding card printing machine manufacturer, wedding card printing machine dealer, min offset supplier & mini offset exporter and are best wedding card printing machine manufacturer in india and wedding card printing machine dealer in india. We are the pamphlet printing machine manufacturer, pamphlet printing machine dealer, min offset supplier & mini offset exporter and are best pamphlet printing machine manufacturer in india and pamphlet printing machine dealer in india. FAIRPRINT’s Little Master is ideal for short run jobs. Brochure Printing Machine is a Great Solution for Offset Printers who are expanding for printing of small size papers and is Best Value for Money for offset printers entering into offset printing work with low budget . This Mini Offset is compact, easy to run & highly productive which can be used in Screen Printing Houses, Letter Press Houses, D.T.P. units & Small Enterprises – Thus opening new venues for shifting to Advance Technology by providing opportunity for becoming offset printers at no hurdles. This machine is commonly known as Mini Offset or Baby Offset worldwide. Fair Deal Engineers are the leading brochure printing machine manufacturers in india and brochure printing machine dealers in india. We are the brochure printing machine manufacturer, brochure printing machine dealer, min offset supplier & mini offset exporter and are best brochure printing machine manufacturer in india and brochure printing machine dealer in india.